Le groupe SOUNDS OF LIBERATION est n? ? Philadelphie en 1971 ? l?initiative de Khan Jamal. Outre le vibraphoniste, Monnette Sudler, Dwight James, les percussionnistes Rashid Salim et Omar Hill et le bassiste Bill Mays faisaient partie de cette formation qui d?fendait une musique ?r?volutionnaire? dans les nombreux parcs de Philadelphie. En effet, bien qu?empruntant au hard-bop et free jazz populaires ? l? ?poque, le r?pertoire ?tait davantage tourn?e vers le sons funky et bien dansants que les clubs de l? ?poque n? ?taient pas pr?s ? accueillir. Byard Lancaster rejoint la formation en 1974 et participe ? l?enregistrement du premier disque ?New Horizons? publi? sur son label Dogtown. Plus de trente ans apr?s, le groupe se reforme et se nourrit des nombreuses exp?riences musicales de ses membres originels. Ils seront rejoints par la po?tesse Pheralyn Dove, disciple de Sonia Sanchez. 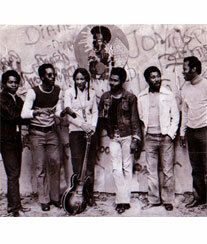 The SOUNDS OF LIBERATION was born in Philadelphia in 1971 at the initiative of Khan Jamal. The vibraphonist was joined by Monnette Sudler, Dwight James, the percussionists Rashid Salim and Omar Hill and the bassist Bill Mays. The sextet was defending a ?revolutionary? music by playing in the parks of Philly. Although the repertoire was inspired by hard bop and free music idioms popular at that time, the music was funkier and made to move audiences. Byard Lancaster joined the band in 1974 and participated to their first recording (?New Horizons?) issued on his Dogtown label. More than 30 year after, the band reunites with almost all its original members and is joined by a fantastic poet, Pheralyn Dove.